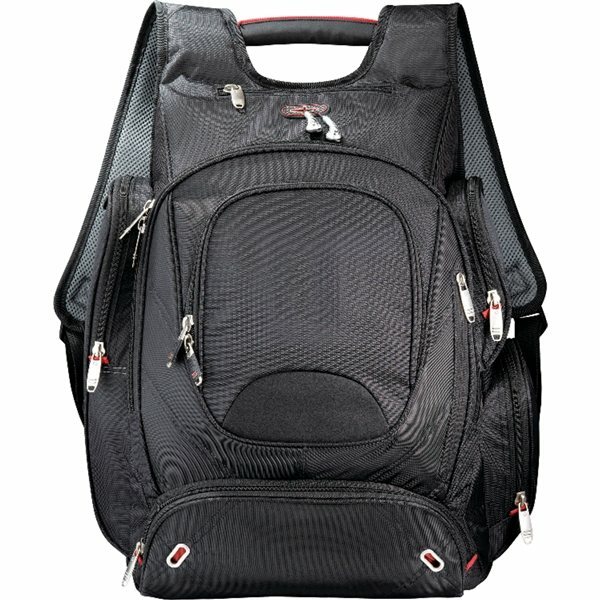 The Elleven Checkpoint Friendly Backpack is not just a high quality laptop backpack, it’s designed for frequent flyers. The special laptop-only section unfolds to lay flat on an X-ray belt to get through TSA checkpoints quickly. This backpack also plays nicely with the rest of your luggage — a back panel conveniently slips over the trolley handles of rolling suitcases. 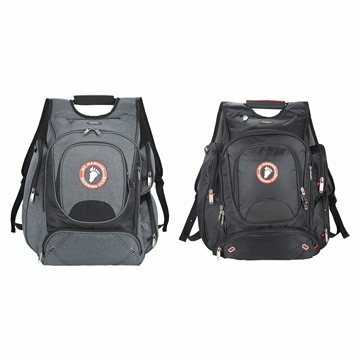 This travelling backpack is a customer-rated "Top 100" item because it is simply one of the best backpacks for taking on a plane. 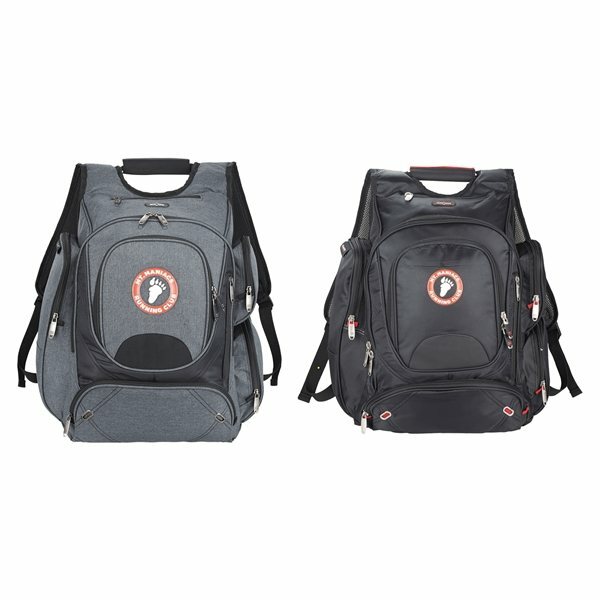 If you have employees that frequently take business trips or are looking for a quality corporate gift, this backpack may be for you. Not only does this techno traveler’s backpack feature accommodation for a laptop, it’s designed to accommodate your business needs as well. 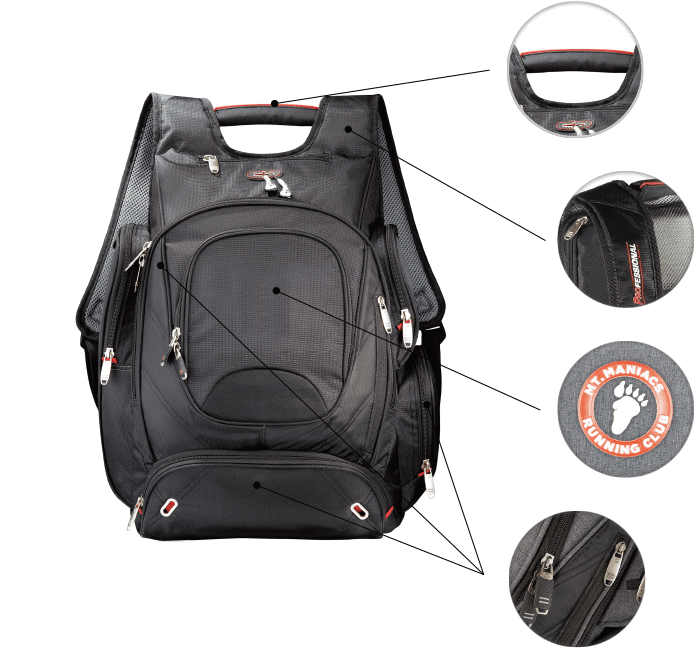 The main compartment features a file divider and a removable TechTrap elastic organizer panel so you can safely transport important documents. The front organizer has pockets for notebooks, pens, and a key fob. Laptop section unzips and can be folded out alongside the main section of the backpack on an X-ray belt, for faster security checkpoint clearance. 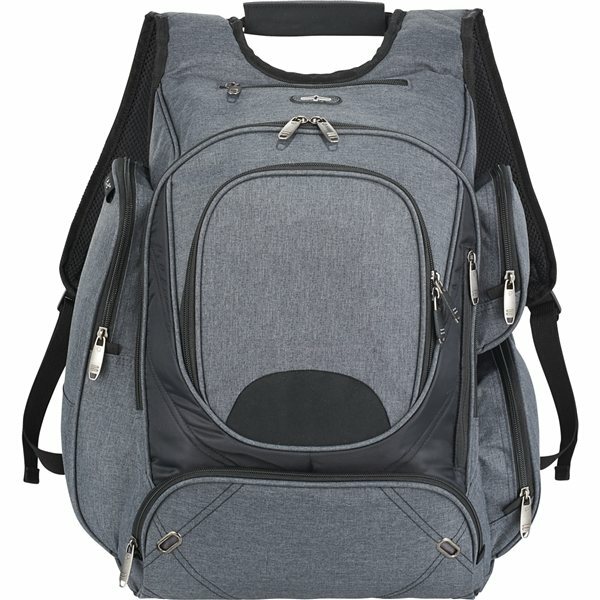 Features earbud port on the top of the bag so that headphones can be fit through while the backpack is being worn. Zippered media pocket accesses earbud port. Three side roomy zippered pockets; Front lower & hidden pockets for valuables; Front zippered pocket with deluxe organization and key fob. A zippered laptop compartment unfolds to lay at on an X-ray belt for quicker security checks. Features a convenient panel on the back that slips over the trolley handles of a rolling suitcase. Main compartment includes a removable TechTrap elastic organizer panel to organize loose tech items. Perfect size and the colors look fantastic! The price was great, too. the service was great and my sales representative was fantastic. Great value. Quality product. Logo turned out just as the mock it. Will definitely consider AnyPromo in the future. While it's very light, it doesn't feel like it would break easily. It is nice. We have reordered these several times and they are very popular at tradeshows and as employee giveaways. I like the finished product. they were great everybody seems to like them.